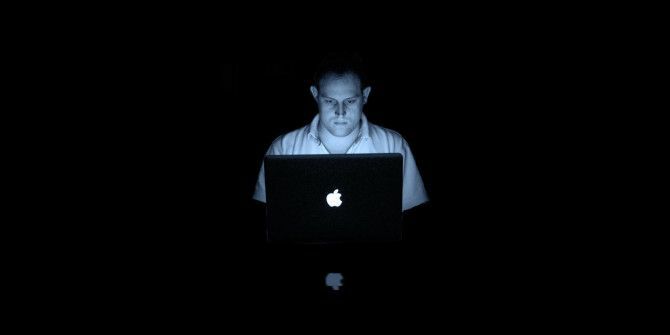 Is your Mac too bright in dark places? Whether you need to work in the dark without being noticed or want your screen to be easier on your eyes, we’ve found apps for that. If your eyes hurt when you use your Mac Why Your Eyes Hurt Using a New iPhone, iPad Or iMac Why Your Eyes Hurt Using a New iPhone, iPad Or iMac The Apple LED screen is a common source of complaint among consumers. Many new iPhone, iPad, and Mac users have reported that it causes eyestrain and general discomfort, yet if you look around on the... Read More , it might be because you’re staring a bright light in a dark room. Turning on some lights around you is a good idea, but it also might help if you make your Mac less bright. The first step, of course, is to simply turn down the brightness. But if that’s not enough, there are apps and tricks you can help make using your Mac in the dark as pleasant as possible. Your Mac’s monitor is basically a lightbulb, something everyone will notice if you’re using it in a dark place. Don’t subject everyone around you to that – use Tranquility (free) to vastly reduce the amount of light you’re emitting. This app adds an item to your menubar, which can be quickly used to invert your Mac’s screen colors. It also lets you set whatever tint you want – I recommend a combination of black and red, for minimal light leakage. This obviously isn’t ideal for everyday graphics work, but is perfect in other situations. If you’re using your computer to program the lights in a dark theatre, for example, software like this is essential. You could just as easily use this to do a bit of night-time reading. It’s a simple way to give your Mac a nighttime mode, something your eyes will likely thank you for. If all you want is to invert colors, you don’t need a dedicated piece of software. Just press Control, Option, Command and 8 at once – the switch should happen immediately. That’s it. You can now invert your colors anytime you want using the keyboard shortcut. You won’t get the color options of Tranquility, but on the plus side there’s nothing to install. Of course, you may not care to invert your colors at all – you may depend on those colors to do your job. F.lux (free) prevents late-night computer usage from disrupting your sleep cycles Use F.lux To Sleep Better After Late-Night Computer Activities Use F.lux To Sleep Better After Late-Night Computer Activities If you look carefully, most of LCD monitors have a button to automatically change the attributes of the screen to adjust for the types of media which is being viewed. Read More , and could be just right for you. The app tints your screen at night, meaning the light emitted is comparable to the lightbulbs around you. The app uses your location and the time to automatically apply its tint, meaning you might not even notice it’s doing anything at all. If you’ve had trouble sleeping after late night computer sessions, give this a shot. Even if you haven’t, you’ll probably find that using your computer at night is more pleasant with f.lux. Give it a shot. Tools like these can reduce computer-related eye strain 4 Ways To Prevent Computer-Related Eye Strain Without Losing Productivity 4 Ways To Prevent Computer-Related Eye Strain Without Losing Productivity Do you spend many hours in front of a computer screen? If you do, you’re probably familiar with the inescapable eye strain that comes with it. Headaches, burning eyes, itchiness and just being tired, are... Read More , but they’re only suitable in some instances. You could look into Shades, which gives you more control over your Mac’s brightness How to Change The Brightness Of Your Mac Display Beyond Default Levels How to Change The Brightness Of Your Mac Display Beyond Default Levels Read More . It was a little buggy in my tests, and it puts a floating brightness switch over your entire system, but you might like it. Can you think of any other software that makes using your Mac in the dark better? Please share them below, so everyone can find out about them. Man, thank you so much!!! You're post was really useful. Tranquility is the same exact thing as NOCTURINE. Copyright infringement. That's not how copyright works, but it does seem as though Nocturine existed first. Good find, thanks for pointing it out. I'm going to get one of these right away. I sit at a computer from eight to five. Then get home and want to see my own non-work related content. I could use some relief. Can i use this tips invert colors in my Windows 7 laptop? you can also use f.lux on windows and activate 'darkroom mode' just right click on the icon in the notification area in the taskbar and click 'darkroom mode' button.